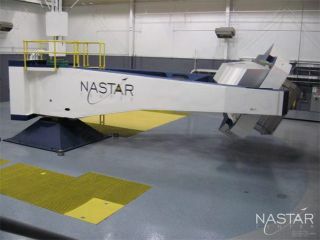 Trainees of the Suborbital Space Scientist Training course underwent G-tolerance training using NASTAR's ATFS/STS-400 machine. Civilians may soon be able to takespace trips, with companieslike Virgin Galactic and Armadillo Aerospace developing spacecraft thatwould offerbrief tours just shy of Earth orbit. To prepare themselves for the daythey can make a suborbitaljourney, eight people ? including an aspiring astronaut ? areundergoingcentrifuge and altitude chamber tests this week as part of a three-daycourse atthe NationalAerospace Training and Research Center in Southampton, Pa.
"The course is geared for researchers? professors andgrad students ? to understand and design experiments for suborbitalspaceflight," said Brienna Henwood, director of NASTAR's Space Trainingand Research Programs. "Suborbitalspaceflight hasn?t actually happened yet, but it is emerging." Most of the eight trainees for thisweek's SuborbitalScientist's Training program, set to run Monday through Wednesday, areresearchscientists at U.S. universities. One participant has applied to jointheEuropean astronaut corps. NASTAR, owned by a Pennsylvaniacompany, EnvironmentalTectonics Corp., is charging $3,000 per person for the three-dayprogram,during which thetrainees will learn techniques to manage the physiologicalandpsychological strain of spaceflight. NASTAR's first coursefor suborbitalscientists was in January. Participants ride on a centrifugesimulator that will causethem to experience up to 6 Gs, or six times the normal force ofgravity,mimicking the stresses they would feel during launch and landing. Theyalsoundergo altitude training in a hypobaric chamber that will slowlydecrease airpressure, simulating conditions at 18,000 feet (5.49 km) altitude. During these and other exercises, thetrainees become familiarwith how their bodies respond and will work to make the most of thespaceflightexperience. A special distraction exercise teaches the scientists howto payattention to their experiments and get work done during the preciousfourminutes or so of microgravity that a suborbitalspaceflight would afford. Suborbital spaceflights, when theybecome available, willprovide civilian researchers with their first chance to conduct theirown experimentsin space. While many science projects are already taken up to theInternationalSpace Station, they are being conducted by astronauts on behalf ofresearchers.And while civilians can board commercial zero-G flights, which fly inparabolicarcs, those flights provide only moments of weightlessness, not enoughtime toget science done. "This is the first time that if youhad some sort ofscience experiment, and you need to flip a switch or need torecalibrate andreadjust the experiment, these people will be able to do thatthemselves,"Henwood told SPACE.com. Both VirginGalactic and Armadillo Aerospace's spacecraft are still underdevelopment.Once they begin flying, tourists are expected to be charged about$200,000 bythe former company, and $102,000 by the latter. SPACE.com reporter ClaraMoskowitz has been invited tojoin the NASTAR training program this week. She'll be posting updatesabout herexperience on SPACE.com's Facebook page here:http://www.facebook.com/pages/Spacecom/17610706465.